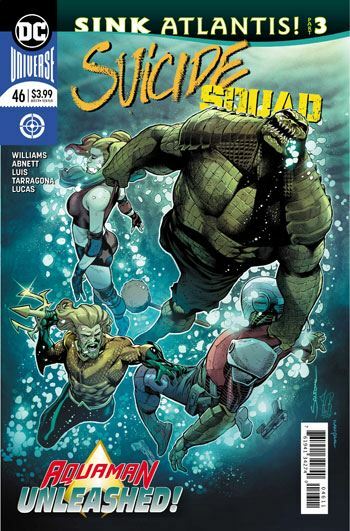 The latest issue of Suicide Squad, which continues the crossover with Aquaman, is pretty much perfect. Seriously. This advances the plots of both books, has humour, tension, a good death scene, and a great climax. There is no way I could possibly think of to improve this story. Part of this is likely due to having Dan Abnett working alongside Rob Williams on the issue. 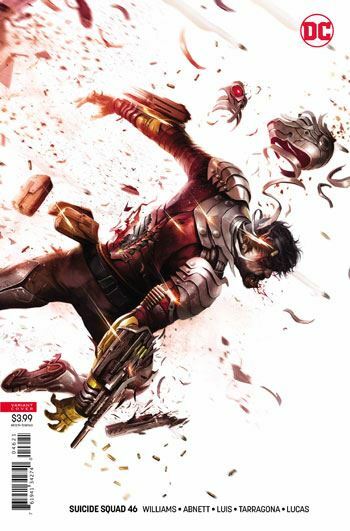 It comes off much less like the Suicide Squad side to a larger story, and more like an integrated chapter in the overall tale. The Squad winds up diverging into two groups. Lord Satanis is determined to set off the nuke and use the release of power to increase his own levels. Harley Quinn leads the other team members, who join forces with Aquaman to save the city. I was quite interested in the little bit of information that is given about the Master Jailer. I am old enough to recall the introduction of this Superman villain back in the 70s. Originally, Carl Draper took to a life of crime out of jealousy, with his unrequited love for Lana Lang. The post-Crisis version was given a daughter, and his motivation was primarily to promote his own company, pretending to be a villain in order to do so. There were some less defined appearances by the Master Jailer along the way, but the man who appears in this story seems different from previous incarnations. True, he does have a daughter, but this one does not construct jails or cells. He is a master of breaking into things, and, it seems, is a genuinely new version of the character. The stakes just keep mounting in this storyline, and Mera gets a great scene to close out the issue, and lead in to the next Aquaman issue.